The Laburnum goldenchain tree will be the star of your garden when it is in flower. Small, airy and graceful, the tree decks itself out in springtime with golden, wisteria-like flower panicles that droop from every branch. The one downside of this pretty ornamental tree is the fact that every part of it is toxic. Read on for more Laburnum tree information, including how to grow a Laburnum tree. The Laburnum goldenchain tree (Laburnum spp.) only grows some 25 feet tall and 18 feet wide, but it is a magnificent sight in the backyard when it’s covered with golden blossoms. The drooping, 10-inch flower clusters are incredibly showy when they appear on the deciduous tree in springtime. The leaves appear in small clusters. Each leaf is oval and stays green until the time it falls from the tree in autumn. 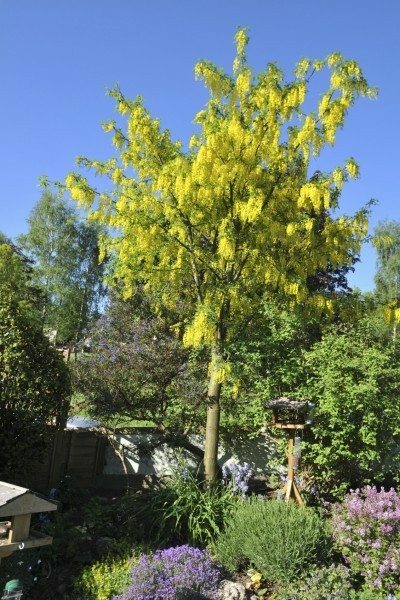 If you are wondering how to grow a Laburnum tree, you’ll be glad to know that the Laburnum goldenchain tree is not too picky. It grows in direct sunlight and partial sun. It tolerates almost any type of soil, as long as it is not waterlogged, but it prefers well-drained alkaline loam. Caring for Laburnum trees is easiest in U.S. Department of Agriculture plant hardiness zones 5b through 7. Growing goldenchain trees requires pruning when they are young. The healthiest and most attractive trees grow on one strong leader. When you are caring for Laburnum trees, prune out secondary leaders early to help the trees develop strong structures. If you expect foot or vehicle traffic beneath the tree, you’ll have to prune its canopy back as well. 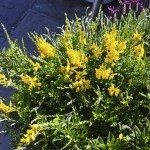 Since the roots of the Laburnum goldenchain tree are not invasive, don’t hesitate to start growing goldenchain trees near your home or driveway. These trees also work well in containers on the patio. Note: If you are growing goldenchain trees, remember that all parts of the tree are toxic, including leaves, roots and seeds. If enough is ingested, it may be fatal. Keep children and pets well away from these trees. Laburnum trees are often used on arches. One cultivar frequently planted on arches is the award-winning ‘Vossii’ (Laburnum x waterii ‘Vossii’). It is appreciated for its abundant and stunning blossoms. Read more articles about Goldenchain.